This new edition of Herbert Fingarette's classic study in philosophical psychology now includes a provocative recent essay on the topic by the author. A seminal work, the book has deeply influenced the fields of philosophy, ethics, psychology, and cognitive science, and it remains an important focal point for the large body of literature on self-deception that has appeared since its publication. How can one deceive oneself if the very idea of deception implies that the deceiver knows the truth? The resolution of this paradox leads Fingarette to fundamental insights into the mind at work. He questions our basic ideas of self and the unconscious, personal responsibility and our ethical categories of guilt and innocence. Fingarette applies these ideas to the philosophies of Sartre and Kierkegaard, as well as to Freud's psychoanalytic theories and to contemporary research into neurosurgery. 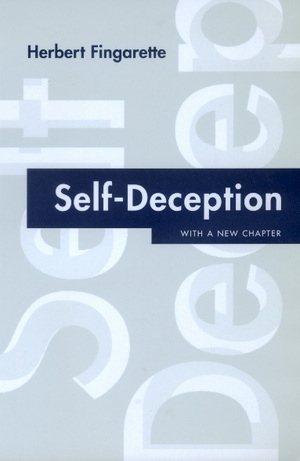 Included in this new edition, Fingarette's most recent essay, "Self-Deception Needs No Explaining (1998)," challenges the ideas in the extant literature. Herbert Fingarette is Professor Emeritus of Philosophy at the University of California, Santa Barbara. In addition to Self-Deception (1969), he is the author of The Self in Transformation (1963), On Responsibility (1967), The Meaning of Criminal Insanity (California, 1972), Confucius: The Secular as Sacred (1972), Mental Disabilities and Criminal Responsibility (California 1979), Heavy Drinking: The Myth of Alcoholism as a Disease (California 1988), and Death: Philosophical Soundings (1996).